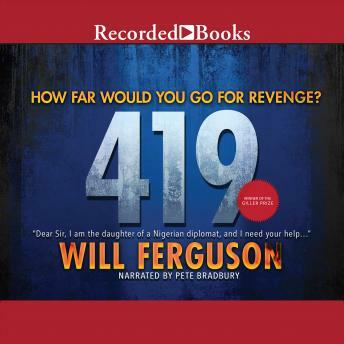 Will Ferguson takes readers deep into the labyrinth of lies that is "419," winner of the 2012 Scotiabank Giller Prize. A car tumbles through darkness down a snowy ravine. A woman without a name walks out of a dust storm in sub-Saharan Africa. And in the seething heat of Lagos City, a criminal cartel scours the Internet, looking for victims. Lives intersect. Worlds collide. And it all begins with a single email: "" Dear Sir, I am the daughter of a Nigerian diplomat, and I need your help"". When Laura Curtis, a lonely editor in a cold northern city, discovers that her father has died because of one such swindle, she sets out to track down-- and corner-- her father' s killer. It is a dangerous game she' s playing, however, and the stakes are higher than she can ever imagine. Woven into Laura' s journey is a mysterious woman from the African Sahel with scars etched into her skin and a young man who finds himself caught up in a web of violence and deceit. And running through it, a dying father' s final words: " You, I love."